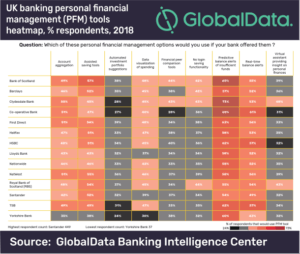 The majority of UK banking customers prefer day-to-day assistance with existing personal financial management (PFM) tasks like simple balance alerts, rather than more sophisticated financial planning tools such as robo-advisors or AI-driven virtual assistants, according to GlobalData, a leading data and analytics company. The company’s latest UK banking heat map, which analyses 14 leading UK bank customers interest in nine PFM tools, reveals that respondents are more likely to use tools to help them manage their day-to-day finance requirements like ‘predictive balance alerts of insufficient funds’, ‘real-time balance alerts’, ‘assisted savings tools’ and ‘data visualization of spending’ rather than longer term financial planning tools like ‘automated investment portfolio suggestions’ or ‘virtual assistance providing insight on personal finances’. Interest in using PFM tools is highest among customers of the Bank of Scotland, Clydesdale Bank, and Royal Bank of Scotland and lowest at Yorkshire Bank, TSB and Santander.